Pierate - Pie Reviews: McDonald’s pie review – are you taking the Mc? It’s almost with a sense of irony that on American Pie Day (or National Pie Day, as they call it in the States), when the Stars and Stripes come out to celebrate all things pie, I feel led to vent my frustration once again at one of America’s most successful global firms. 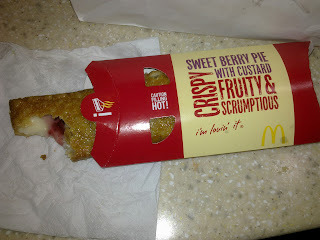 For once again, given the op-pie-tunity to provide the world with a great, warm, winter-busting fruit pie, McDonald’s have once again given us... a battered slice. Quite frankly, I feel they’re just taking the mick. McDonald's Sweet Berry Pie... or so they call it! For in place of their regular Apple “Pie” and shortly after the release of their festive Christmas Orange Flavour Chocolate “Pie”, McDonald’s have this time come up with a Sweet Berry and Custard “Pie”. Yeah, that’s right. I think the quotation marks tell you everything. It’s not pastry, it’s not a pie (with clearly defined base, sides and lid), and quite frankly, it’s not acceptable! I’m very close to writing an open letter to the head of McDonald’s UK McPastry department to try and combat this blatant false advertising under the “pie” banner, which has the potential to con avid pie eaters into purchasing and consuming a counterfeit good. Sure, the pastry product tastes nice, sure it’s a novel flavour, but for the last time... IT’S NOT A PIE!! !